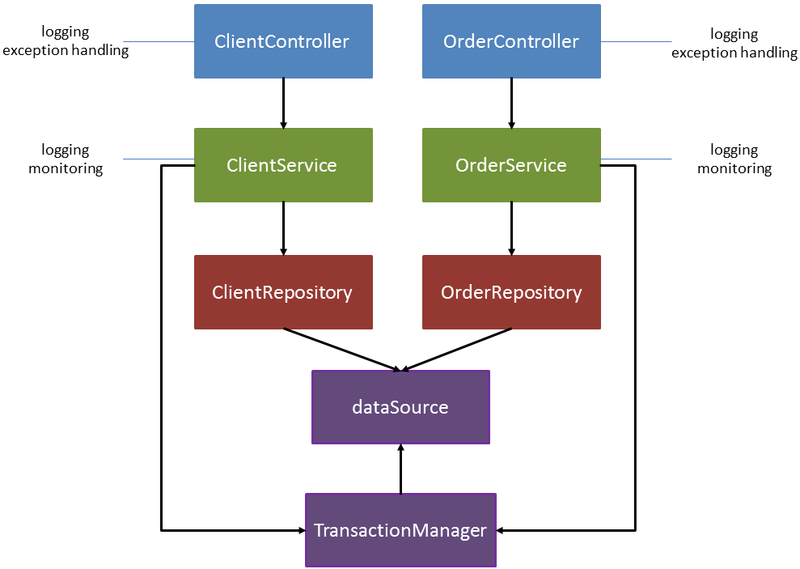 This article explains how to apply aspect oriented programming with Spring AOP. The main target of the aspect oriented programming is the separation of cross-cutting concerns. When we talk about cross-cutting concerns we are referring to generic functionality that is used in several places in our system or application. The way to achieve this separation is by modularizing these concepts. This will allow us to keep our business logic classes clean, containing only the code for which the class was designed. If we don’t modularize these concerns, it will lead to code tangling (the class contains different concerns) and code scattering (the same concern will be spread across the system). Each class contains only the business logic related code, while the aspects will be responsible of intercepting the code in order to inject the cross-cutting concerns. Source code can be found at my Github repository. The objective of this controller consists in retrieving a client and returning a view showing its information but, as you can see, this code contains additional logic. In one hand, it handles exceptions that may be thrown by the service and it redirects to an error page. On the other hand, it generates logging information and notification sending in case of error. All this code is generic to all controllers in this application (and probably to other classes). It’s true that we could have used the @ControllerAdvice annotation to centralize exception handling, but the target of this post is to see how to accomplish it with Spring AOP. The same happens with the order controller. I won’t include it here because I don’t want to make the post unnecessary long. If you want to check it out, you can get the source code included in the previous link. In addition to the service invocation, it also contains logging generation and monitoring of the execution time in each invocation. We could also use aspects to modularize transaction management if we needed to use programmatic transaction management, but it’s not the case in this example. This code does not contain any cross-cutting concern but I’ve included it to show all the sample application layers. The component-scan tag will search within the base package in order to find our aspects. To use auto scan, you not only need to define the aspect class with @Aspect annotation, but also you will need to include @Component annotation. If you don’t include @Component you will need to define the aspect in the xml configuration file. But be aware that this advice will not prevent the exception from propagating. To sum up, we have seen how to apply aspect oriented programming to keep our code clean and focused to the logic for which it was designed. Before using AOP, just take into account its known limitations. This is one of the best article I read on Spring AOP. I also like the way you have used the template to show code and explanation of it. For sharing my code snippets, I use gist (https://gist.github.com/). It's pretty handy. Great article! I have ported part of AspectJ to PHP (Go! AOP Project) and your article is perfect manual for my framework too. Will share the link to this article. I'm really glad it's been useful to you, Alexander. And thanks a lot for sharing!